"The Box took me right back to my childhood and my children's childhood. Now, I can read it to my grandchildren and tell them how I played with a box and how their Mom or Dad did. Jo Linsdell has written a fun book with illustrations that will touch your heart and take you back in time. It has just the right number of words and sentences to connect to your toddler's imagination and stay within their attentive span. When I get a new book for the grandchildren I often bring something to go with it like seeds and a shovel for a book about a garden. How neat is this. I will only need to find a discarded box! Imagination is a wonderful thing to promote. This really does deserve 5 stars." "I loved this book! 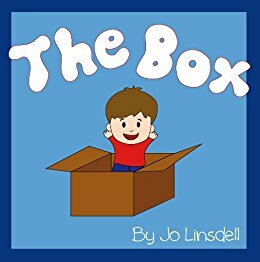 The Box by Jo Linsdell has all the makings of a favorite children's book: simple,imaginative and fun. I wish I had this book when my boy was a toddler, but there are others in my life who are going to enjoy seeing all the creative things they can do with a box. And then, I'm sure, they will want to immediately read the book again! Congratulations to Jo Linsdell on a very lovely book." "Jo Linsdell is a genius. 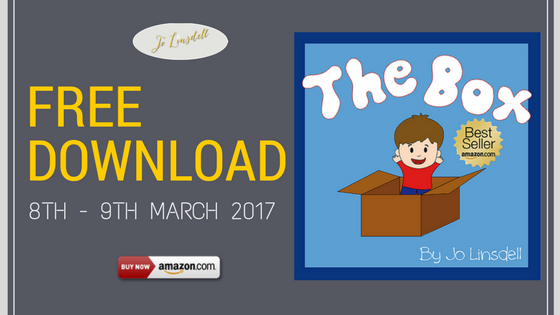 The Box, is a delightful little book and fun to read to little ones. The story is simply done, with just the right amount of text and the illustrations add to it perfectly. My youngest child clients absolutely love it. It's so much fun to read about all the imaginative activities a child could do with a box. (And to think an adult wrote this!) After the story ends I encourage kids to think up more ways to use a box...."Because a box is just a box, except when it's not." This is a wonderful book and I highly recommend it." The artwork is beautiful, clear and engaging for both a child and the adult reading the story. I really enjoy the clean simplicity. A great book for that special boy who will always remember the fun he had with a simple box! This is a great indoor/rainy day or outdoor fun story! Works all around! :)"
"What I’ve always loved about Linsdell’s children’s books is their simplicity and creativity. As a mom, she knows what young readers are looking for. She proves this once again with The Box. How often do parents joke that we buy our kids a bunch of toys for their birthday and they end up playing with the boxes? Linsdell truly gets into the heart of a child with this one. The adorable illustrations keep the reader focused on the boy and his magic box that he can transform into anything." "The text, illustrations, and the theme of the book is simplicity at its best. It is not complicated, fancy, or hard to understand. The book shares the creative possibilities of taking a simple cardboard box and using imagination to let it become an endless array of possibilities to entertain and amuse young children. The thought struck me as I read it how things in life need to be simplified to the basics. 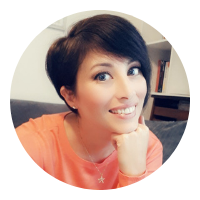 A great book for adults to share with young children"
Once you've read the book please take a moment to post a quick review to Amazon and/or Goodreads. It will only take you a minute, but will make a big difference for me. Thanks in advance for your support.